This is a unique opportunity to give and receive! 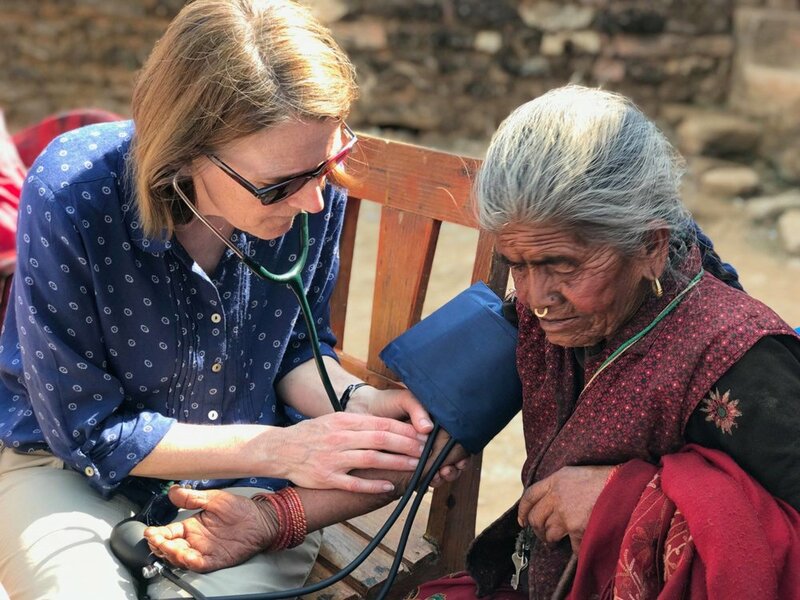 Like a precious gift that keeps on giving, this will be a life-changing and therapeutic experience for you, with funds raised to provide a medical outreach camp in a remote, earthquake-affected region of Nepal. 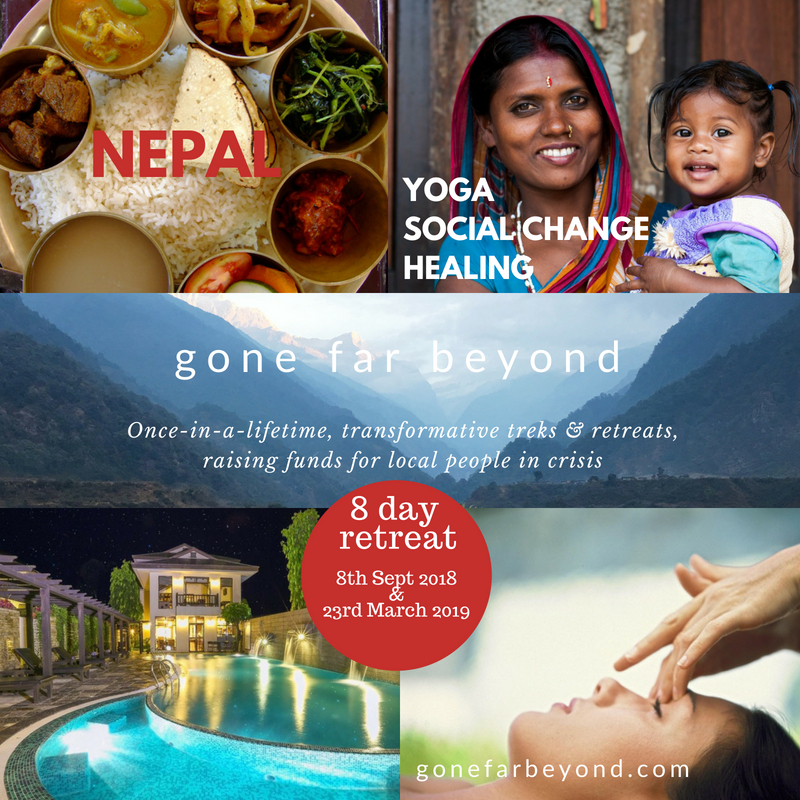 On this transformational and healing journey, you will experience the exquisite beauty of a four day gentle hike in the Himalayas and a stunning four day yoga retreat at your private boutique resort in Pokhara. Enjoy a complimentary Nepalese massage or spiritual healing treatment, taste delicious Nepalese food, discover the local culture, learn about the simplicity and magic of Nepalese life and experience deep therapeutic yoga and meditation practices to revive your soul. Gone Far Beyond will donate AUD$200 (approx. USD$150) for every member to the medical camp. Extra contributions or fundraising with friends and family are welcome but there is no obligation. JOIN US FOR THE RETREAT AND, IF YOU WISH, FOR THE MEDICAL CAMP AFTERWARDS. With hundreds of villagers coming to the outreach camp we will need extra hands to help on the 3 day medical mission. Springtime in Nepal is spectacular: the flowers, the clear, majestic mountain views, the warm weather and a magic in the air. 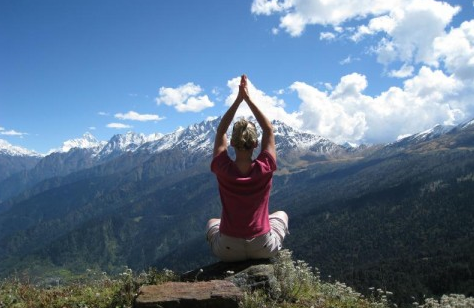 The Himalayas have always been associated with healing, inspiration, spirituality, beauty, and of course, yoga! Since ancient times, yogis have meditated in these mountains to acquire deep insight. You will be greeted on arrival with a traditional Nepali welcoming ceremony at your stunning Himalayan-style hotel in Pokhara. Here you can unwind, enjoy your first evening and prepare yourself for the daily meditation, yoga and trekking that will follow. During your first four days you will embark on a teahouse trek and be immersed in Nepal's profound beauty. You will experience Nepal's picturesque and heartwarming mountain village life, with its overwhelming hospitality and fresh local food. You will also visit a Tibetan village and monastery to experience the magical chanting of the Tibetan buddhist monks. You will then spend the final four days back at your hotel indulging in a divine Himalayan yoga and meditation retreat near Phewa Lake and surrounded by majestic mountains. You will have free time to explore Pokhara, the stunning lake and the multitude of lakeside cafes, shops and local sights. Pokhara is a breathtaking and special place. The small town is nestled between the majestic Phewa Lake and the snowcapped Himalayan mountains. Your boutique retreat resort is walking distance to the lake with views of the mountains readily visible. The hotel offers you full room service, pool, spa, air conditioning, vegetarian cuisine and your own private deluxe suite and balcony. This trip offers you the best of Nepal! The trek will show you authentic village life. You will stay in a quaint but comfortable Nepalese teahouse (similar to a guesthouse) and experience traditional Nepalese music, dancing, singing by the fire, traditional mountain food and breathtaking Himalayan views. The retreat will then allow you to indulge in the peace and luxury of the resort. You will enjoy beautiful, transformational and insightful therapeutic yoga practices designed to help you release, relax and regain a sense of wholeness and personal meaning. The trek includes: all food, professional yoga and meditation teacher, accommodation, expert mountain guide and porter. You are also welcome to book your own personal porter to carry your pack on the hike. The trek will be a light and enjoyable with no altitude issues or stress. There will be daily yoga and medication and also plenty of time for you to relax, find peace and make discoveries for yourself. How much you participate is your choice. As we say in Nepal: "As you wish!" During the retreat: you will be treated to the comfort of the hotel, deep therapeutic yoga and meditation sessions and the chance to visit a few of Pokhara’s finest restaurants. 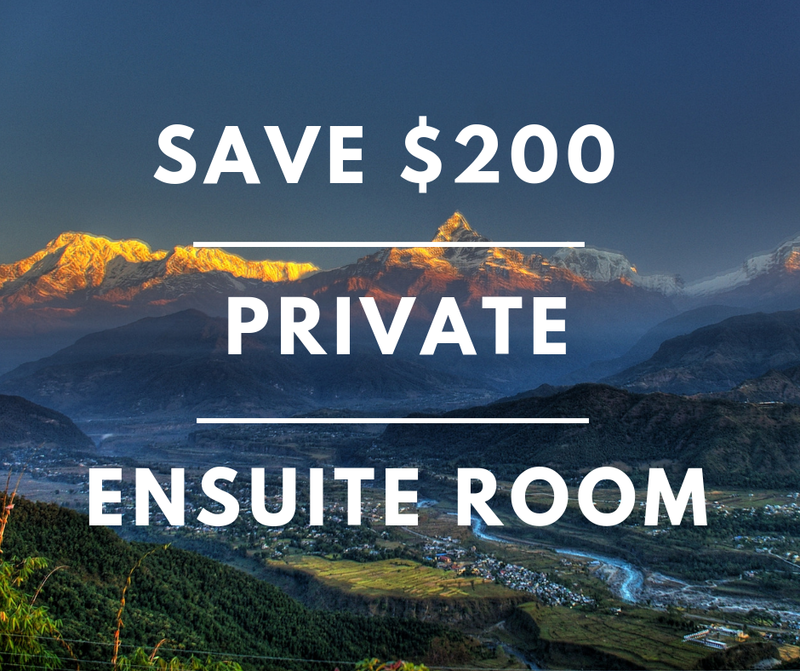 In your free time, you can take advantage of the complimentary Nepalese massage or traditional healing session that is included in the retreat fee. Alternatively, you can simply enjoy the peacefulness of the resort. If you want to explore a little further, you can take a short stroll to the lakeside shops and cafes just a few minutes away. Yoga and social work are united by the principles of service, humanity, equality, compassion, liberation, openness, understanding and transcending boundaries. During the trip we will live by these principles. Marissa is a yoga teacher who has lived in the Himalayas for 6 years. She will introduce you to Nepalese yoga and meditation teachers she has come to know who will share their unique practices and beautiful way of life. As a therapist and social worker, every retreat and experience Marissa creates is motivated to help others. For this trip, AUD$200 per person will be donated to a medical relief camp that takes place in the days following the retreat. Extra contributions are welcome and members are free to raise additional funds themselves. Every dollar helps enormously, but there is no obligation. Gorkha was one of the most affected areas by the earthquake in 2015. From the funds we raise, on the 1st and 2nd of April 2019 we will be providing a medical health camp in the district of Gorkha. Our team includes a general practitioner, a radiologist, four nurses, four pharmacists and 10 local volunteers. The health camp will operate between 7am and 7pm with a travel day either side to travel to and from Gorkha. We estimate about 700 patients will visit the camp, who often walk up to five hours to attend, with the majority of patients being women, children and the elderly. From past medical missions the most frequent issues were pain, infections, access to medication and other monsoon-related problems. Some patients also require further evaluation from specialists potentially requiring travel to Kathmandu. As a local social worker in Asia, Marissa works closely with grassroots organisations, community leaders and local people to identify where our help can be of the greatest benefit, with the most positive and long-term social change, and without any negative social effects. You will have the opportunity to learn about the complex social issues of Nepal, its history, its crises and understand the intricacies of social development and knowing how to contribute effectively. You will also meet the grassroots team we work with at KarmaFlights that are dedicated to responding to critical issues in Nepal. After the retreat, you are very welcome to stay for a few extra days and travel with us to Gorkha to set up the medical relief post. With hundreds of villagers attending, we will need extra hands to hand out water, arranging the camp and organising patients. You will see real Nepalese village life, understand firsthand the issues they face, see the critical importance of the work being done and experience the remarkable beauty of the mountain region in which they live. An additional $200AUD per person will be required for the extra 3 days in order to arrange your transport by jeep from Pokhara, your accommodation, supplies and food. 23rd to 30th March 2019. If you book and pay your deposit before 1st December 2019 and save $200 off a private room with ensuite or save $600 off a twin or double share room with ensuite. Full payment is required before 1st March 2019.Cancellation fee is 100%. Group numbers are limited to 10.